Watching my second son develop is such a different experience than it was with my first. I definitely underestimated (or never considered) the influence in development that having an older sibling has on a child. It’s not just the fact that “Star Wars” was one of the first two-word phrases he had, or that Elmo took a back seat almost immediately to the Power Rangers. It’s that he seems to jump beyond his age to try and keep up with his brother who is almost three years older than him. Nothing makes him more proud than to do something like his brother can do. My goal with him this holiday season is to find gifts that will make him feel like a “big boy” but be something he can enjoy at his age with his 2-year-old fine and gross motor skills. 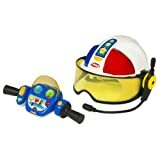 So I was totally excited about this toy from Playskool, the Adventure Squad Police Helmet. It encourages interactive play and role playing – the child wears the helmet and uses a hand-held controller to race around in pursuit like a real policeman. There are different “mission phrases,” and all sorts of fun lights and buttons to push. Buy it on Amazon for $34.99 (13% off retail, and free shipping). « Dora, Sponge Bob, Sesame Street….and YOU!